The summer of 2017 saw big changes in Alberta party politics. The Progressive Conservatives, which had governed the province from 1971 to 2015 and established a Canadian record for longevity, voted itself out of existence. They merged with the official opposition Wildrose to form the United Conservative Party. Not all PC members supported joining their former opponents. Katherine O’Neill, party president during the 2017 leadership race, resigned to explore options for creating a more centrist party. Richard Starke, the leadership race runner-up, opposed the merger and continued to sit as a PC MLA. Two candidates who’d dropped out before the votes were cast also distanced themselves from the UCP: Stephen Khan joined O’Neill in exploring a unite-the-centre option, while Sandra Jansen had crossed the floor to the NDP months earlier. More recently MLA Rick Fraser left the UCP to sit as an independent, stating concerns about polarization in Alberta politics. All of these actions indicate a major shift in Alberta politics. For decades, our province had a one-party-dominant system not seen elsewhere in Canada. Now, however, we seem on the verge of a polarized party system. Before Alberta was a province, our territorial legislature had no firm party lines and members were non-partisan. In 1905 the federal parties effectively imposed themselves on the brand new province. The federal government put in place a Liberal government in Alberta, which won an easy majority in the first provincial election. Certainly, the parties differed over responsible government, confederation, French/English accom-modation and relations with the US and Britain. The words Liberal and Conservative did mean something—drawn from the Whig and the Tory traditions respectively in England. The Tories were more tied to the Anglican Church and landed gentry, the Whigs to the affluent middle class. Once the right to vote was expanded, with the ballot no longer tied to property ownership, a more class-based politics emerged and a Labour party grew with support from working-class voters. The term “Whig” fell into disuse, but “Tory” continues. and Klein were the face of their parties. Elections were about them, their abilities and their priorities. The non-partisan tradition focused on the independence of individual members. Alberta’s party executives in this period included members who federally were both Conservative and Liberal. Their priority was to provide a common front in advancing regional interests and provincial autonomy. Non-partisan government is extremely rare. It continues in Canada only in two territories, where candidates contest elections without party labels, and elected members determine the premier. Parties play a fundamental role in parliamentary democracies. As former British Prime Minister Benjamin Disraeli once said, such governments are impossible without parties and the stability they provide by ensuring the passage of legislation and providing an alternative government. This has proven only a slight exaggeration. The party that elects the most candidates forms government; cabinet ministers are chosen from their ranks. Platforms indicate what parties’ priorities will be if they form government. Citizens can make assumptions about candidates’ beliefs and values based on their party affiliation. Parties communicate political messages, raise money and assist in campaigns. Perhaps most importantly, parties clarify political choices for citizens. Parties provide ongoing opportunities for citizens to indirectly influence policy through choosing leaders and candidates. Rarely are independent candidates elected to the legislature. Opposition parties are important to legislative debate and ensure that alternative perspectives are heard. They hold the government to account through customs such as Question Period. They present an alternative to the party in power. In the event of a government’s defeat, they can provide a smooth transition into office. Political parties simplify accountability. If voters are unhappy with a government, they know they can vote for candidates from the opposition or from a new party altogether. Party organizations also ensure wider competition. Without them, acclamations are more common and the re-election of incumbents, as in municipal politics, is more frequent. Parties also remove the need for political figures to be constantly involved in raising funds for the next election. Parties provide a way to remove leaders. While leaders dominate initially, parties ensure that ongoing tenure is subject to debate. Nonetheless, traditional parties alternating from power to opposition has not been the way in Alberta. When the provincial Liberals fell from office in 1921 they weren’t replaced by Alberta’s other traditionally named party but by a new organization entirely. The United Farmers (UFA) opposed the notion of party government altogether. Instead they endorsed a system of group-government based on occupation. The UFA saw the old parties as controlled by money and special interests and wanted to directly represent the interests of farmers regardless of party preference. The UFA had what we’d today consider a “left-leaning” perspective, including a willingness to regulate the economy and tax more equitably. The rural-supported UFA won a majority government despite receiving far fewer votes than the Liberals they displaced. (The party soon put in place a new electoral system combining the “alternative vote” in rural areas and a more proportional system in the cities.) That the UFA wasn’t a traditional party was illustrated by the refusal of their leader, Henry Wise Wood, to become premier. Solid rural support kept the farmers in power until 1935. The difference between that movement and the old-line parties could be seen in the UFA’s endorsement of the federal CCF, the predecessor of the NDP, in 1932. Indeed, UFA MPs were among the first to sit in parliament under the CCF banner. Throughout its 14 years in office the UFA never became a traditional party in spirit (they even initially included a Labour MLA in cabinet). They believed that members should reflect the desires of constituents rather than UFA policy and had a delegate model of democracy. The notion of party discipline—that is, imposed unanimous party support for legislation—was discouraged and member autonomy remained a critical part of the UFA message even if it wasn’t always realized. Once again when change came to Alberta it wasn’t spurred on by a traditional opposition party. Instead, in 1935, in the dark days of the Great Depression, a new political phenomenon, Social Credit, swept to power by defeating every UFA MLA. That election shook Alberta politics. Aberhart’s efforts at monetary reform and control over the media, however, inspired much opposition. By the 1940 election, with little progress in establishing his new monetary policies, Aberhart faced a serious challenge. It didn’t come from the UFA—which by then had abandoned politics—or even its CCF successor. Nor did the challenge come from an old-line party. Instead, in a situation that resonates with contemporary politics, two parties co-operated to try and oust the government. Liberals and Conservatives, along with the more conservative remnants of the UFA, banded together as the “Unity Movement” and attracted almost as many votes as the governing party. Even Manning’s opponents were reluctant to criticize him personally. The premier presided over a weekly religious broadcast and combined the country’s highest per capita social spending with the lowest taxes. The combination is something many Albertans now accept as a birthright. Social Credit’s success was tied to Aberhart, a charismatic radio preacher with unorthodox political ideas. In the late 1960s, under a new, vigorous leader, the PCs began to make inroads. Peter Lougheed’s “Now!” slogan in 1971 presented his party as a new movement in line with a modern Alberta. Lougheed’s dynamic leadership was reinforced through his proficient use of television. Once in power, Lougheed used the same high-service, low-tax model as Manning and rode waves of high energy prices and prosperity for almost 15 years. Much like Social Credit, he campaigned more against the federal Liberal government than against his provincial competition. Lougheed distinguished between “doers and knockers” (equating criticism to complaining) and presented himself—as scholars Denise Savage-Hughes and David Taras have outlined—as a provincial David fighting a federal Goliath. An easy target and a strong economy made it even more difficult for would-be challengers. Lougheed’s stature as premier was demonstrated by his first-place ranking in a 2012 Policy Options rating of provincial premiers over a 40-year period. Lougheed was ranked first in every category. He presided over an activist government—one willing to use the state in pursuit of policy goals. Eventually a separatist party rose on the right. The Western Canada Concept actually won a by-election in 1982 and over 10 per cent of the vote in the 1983 election. For some Albertans, the PCs were too centrist and accommodating. While right-wing conservative parties tend to favour lower taxation, less regulation, spending cuts over deficits, and generally take a more traditional approach to social issues, Alberta’s PCs proved difficult to characterize in these terms. Nonetheless Lougheed won all but two of Alberta’s 77 seats in 1983. A downturn in the provincial economy, declining oil prices and Lougheed’s retirement ushered in a more competitive political environment, with the NDP and Liberals enjoying more support. The PCs appeared likely to lose the 1993 election. They had recently changed their party, however, partly by launching a new primary style of leadership selection. It vaulted former Calgary mayor Ralph Klein, who had identified as a Liberal before entering provincial politics, to the leadership and sent the runner-up, Nancy Betkowski, to the Liberals (whose leadership she would eventually win). The PCs argued that leadership change represented political change. Indeed, that impression was critical to PC longevity. Under different leaders the party tacked left or right responding to opportunities and challenges. The party called itself a “big tent”—much like the federal Liberals—and portrayed other parties as unready to stand up to the federal government and ideological, that is, committed to a set of policy views regardless of circumstances or the opinions of Albertans. 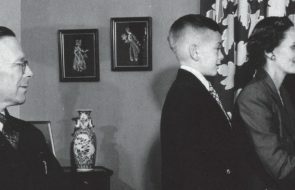 As premier, Klein campaigned against the PC record and presented his party as “Ralph’s Team,” building a unique rapport. His folksy style included asking how policies affected ordinary Albertans, such as the mythical “Martha and Henry.” Treating the federal Liberals as their opposition was also critical to their success. It’s no coincidence that when the PCs faced electoral difficulties (e.g., in 1993 and 2015), a federal conservative party was in power. Blaming Alberta’s problems on Ottawa wasn’t an option. In 2004 Alberta witnessed another right-wing revolt, this time under the auspices of the Alberta Alliance, headed by a former Social Credit leader. That party won 9 per cent of the vote and presaged the emergence of the Wildrose. Klein resigned in 2006 and the race to succeed him became a debate over the PCs’ direction, with some backing Ted Morton, the leadership candidate furthest to the right. Ed Stelmach emerged as a compromise candidate; in this leadership race, as in the next two, the PCs chose a relatively centrist leader. Stronger leaders would eventually take control of the Wildrose (the Alliance had evolved into the Wildrose Alliance, then simply Wildrose), which, through a mix of fiscal and social conservatism and a series of PC scandals, emerged as a real contender. But neither conservative party won in 2015. After the PCs’ defeat, members unhappy with the party’s centrist direction insisted on a return to a convention process. This favours a more ideological and right-wing approach, as it’s more difficult for less-ideological voters to become involved. The convention method places a premium on electing delegates, and the candidate dedicated to creating a unified conservative party—Jason Kenney—won decisively. Alberta was following the same path to right-wing unity as the merger of the federal PCs and Reform/Canadian Alliance. This latest merger is based on the assumption that Alberta needs a united right to rid itself of the “socialist” government elected in 2015. Indeed, the NDP differs from other contemporary parties. It traces its roots to the UFA, which played a role in founding the CCF in 1932 and 1933. The latter endorsed the Regina Manifesto, which called for the eradication of capitalism, and managed to win 11 per cent of the federal vote in 1940. Not until 1986, however, did the CCF’s successor, the NDP, elect more than two members to Alberta’s legislature. The NDP has historically presented itself as ideological—that is, having a coherent and consistent set of policies—as opposed to being pragmatic and leader-focused the way parties in power in Alberta have been up to now. The Alberta NDP refused to engage in efforts to create a new centrist party in the early 21st century. As befits a more ideological party, it was content to offer its views and wait for the citizens to respond. Rachel Notley’s leadership proved crucial in moving the NDP forward. The party capitalized on her campaigning abilities, the province’s economic difficulties and the PCs’ failure to present an image that fit Alberta’s populist streak. The hugely unpopular attempt to unite the PCs and Wildrose via floor crossings also left the NDP placed to capitalize on Albertans’ desire for change. Polls suggest many Wildrose voters from 2012 actually supported the NDP in 2015. The NDP moved toward the centre, tying their tax policies to the views of Albertans and explicitly rejecting calls for a sales tax. The Notley government faces serious fiscal and economic challenges. Like most new NDP governments in Canada, it presents a more centrist image. Its decision to leave oil and gas royalties largely unchanged and continue a low tax regime created space for Sandra Jansen—continuing an Albertan pattern among prominent politicians—to join a rival caucus. The NDP has, however, remained true to its more left-wing approach by eschewing spending cuts, restoring a progressive income tax and presenting a more liberal stance on social policy. It’s difficult to imagine Social Credit’s success without Aberhart or Manning, the PCs’ without Lougheed or Klein, or indeed the NDP’s without Notley. Images of these parties are inextricably linked with their leaders. Alberta may simply be ahead of the Canadian pack. University of Victoria political scientist Reg Whitaker, reflecting on the recent move to primaries to choose leaders in Canada, identifies the formation of “virtual parties” around particular leaders who reconstitute parties in their own image. 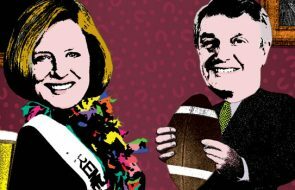 The rise of Notley and the transformation of the PCs under Kenney—strong personalities both—could mean that party leadership continues to distinguish our province’s unique politics. But both leaders also project more polarization than we’re used to. If Alberta party politics has suddenly become more ideological, this would represent a dramatic break from our political past. U of C professor David K. Stewart is co-author of Quasi-Democracy? Parties and Leadership Selection in Alberta.